The CX8090 Embedded PC is a complete PC controller that can perform many different building automation functions inexpensively and in a space-saving Bus Coupler housing. The flexible communication options offer considerable advantages, with two Ethernet interfaces, real-time protocol performance and a direct connection to Beckhoff I/O systems for data acquisition of all signal types. The building automation solution features a highly scalable controller line up, which enables applications to be realised exactly to the individual requirements and at an optimum cost. The CX8090 Embedded PC offers the functionality of a PC controller and is universally suitable for use as a building, room or area controller, or as local intelligence for the control of HVAC, lighting and facades. It has the Windows Embedded Compact operating system, 400 MHz ARM9 CPU, 64 MB DDR2 RAM and a MicroSD card, which can be extended up to 4 GB. The CX8090 is well-suited to cost-sensitive applications where Embedded PCs with mid-range performance or higher are not necessary. It also has the benefit of having energy dissipation of just 3W, which is evidence as to the device’s energy efficiency. 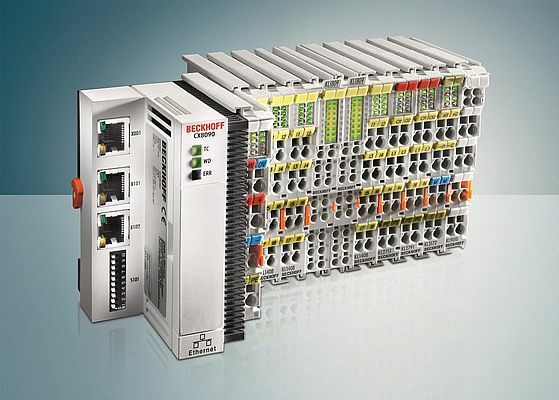 In addition, the CX8090 is ideal for integrating I/O devices: the Beckhoff Bus Terminal system and the EtherCAT Terminal system can be connected directly to the Embedded PC. The CX8090 measures just 65 x 100 x 80 mm and offers two Ethernet interfaces: a 10/100 Mbit/s Ethernet interface which is switched and enables a linear daisy-chain topology that can be configured at a low cost without additional hardware.